It makes storing and location management of cases, random items and small items more efficient. It can also be used as a bookshelf. 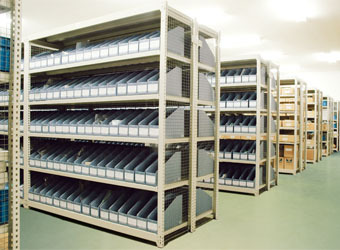 Shelf height can be adjusted in 50 mm intervals to accommodate stored items. Uses: Warehouses, factories, distribution centers, offices, labs, archives, etc. 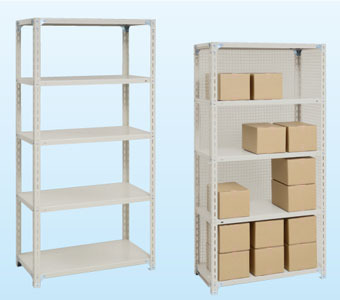 Shelf height can be adjusted in 25 mm intervals to accommodate stored items. It makes storing and location management of cases, random items and small items more efficient. 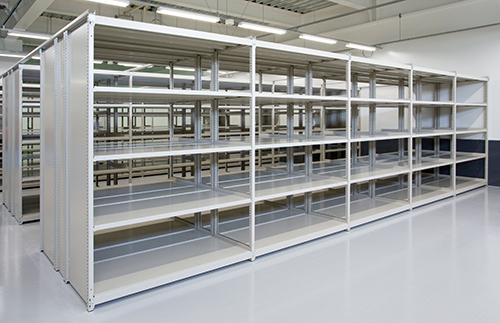 Assembly, disassembly and shelf height adjustment are easy, therefore the rack can be readily reassembled to accommodate changes in stored items. 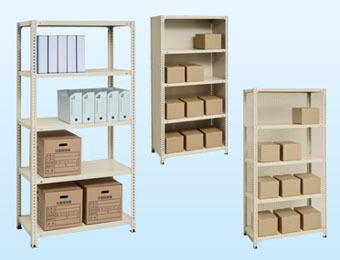 Shelf height can be adjusted in 25 mm intervals to accommodate stored items. Options such as fall prevention bars and wall anchors are available to protect both stored items and people in the event of an earthquake. Uses: Warehouses, factories, distribution centers, archives, etc. 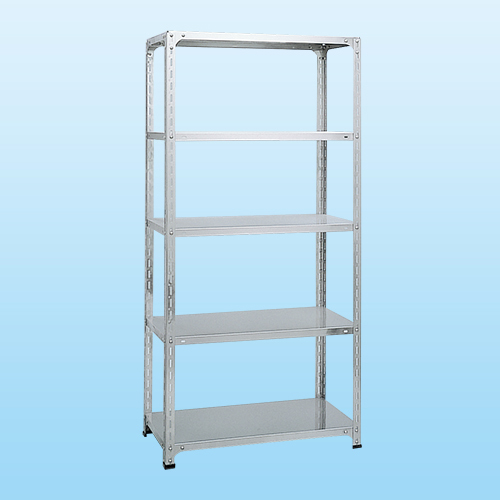 Shelf height can be adjusted in 50 mm intervals to accommodate stored items. Options such as fall prevention bars and wall anchors are available to protect both stored items and people in the event of an earthquake. Uses: Warehouses, factories, distribution centers, etc. The sturdy structure strengthens the frame with trusses, to safely store heavy items. 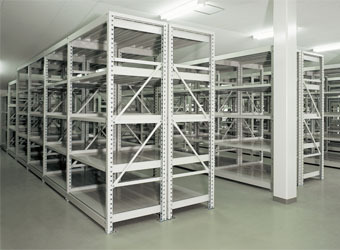 Shelf height can be adjusted in 50 mm intervals to accommodate stored items. 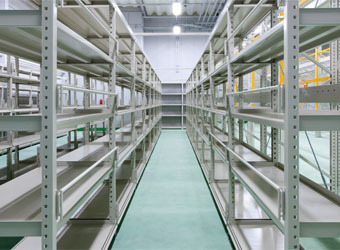 The rack is anchored to the floor, to prevent toppling in the event of an earthquake. This stainless steel rack features good corrosion resistance, chemical resistance and durability. It can be easily cleaned with water for use in sanitary applications. 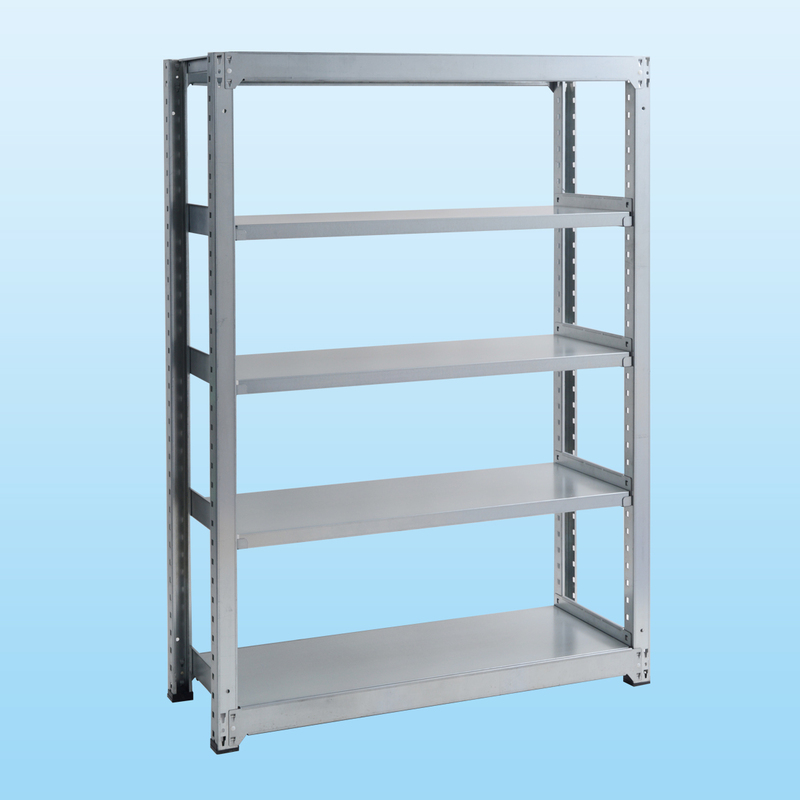 The rack is available in different withstand loads that can be selected according to stored item weight, i.e., light duty (120 kg/shelf), semi-light duty (200 kg/shelf) and middle duty (300 kg/shelf). Uses: Kitchens, clean rooms, hospitals, etc. The excellent corrosion resistance enables safe use over long periods of time. The rack is made of hot dipped steel that offers 10x more corrosion resistance than conventional galvanized steel. Uses: Warehouses that store items outdoors, do-it-yourself stores, etc.